Summer means kids are off school and finally free to do what they do best -- run around outside, climb trees, build forts, play sports, ride bikes, swim and more. It's hard enough to get them to come in for lunch to eat something, let alone get them to drink water throughout the day. On hot summer days, that can be a big problem. (Photo credit: susieq3c via Flickr). Summer means kids are off school and finally free to do what they do best -- run around outside, climb trees, build forts, play sports, ride bikes, swim and more. It's hard enough to get them to come in for lunch to eat something, let alone get them to drink water throughout the day. On hot summer days, that can be a big problem. The facts on children and hydration may shock you. Pound for pound, kids need more water than adults. Their bodies don't cool down as effectively and they're more likely to get dehydrated. So what's a concerned parent to do? Kids tend to love sugary drinks, but organizations such as the Canadian Paediatric Society and Dietitians of Canada recommend avoiding giving kids pop, fruit beverages, vitamin water and energy drinks. Even 100 per cent fruit juice should be limited to 125 ml (1/2 cup) to 375 ml (1 1/2 cups) each day. (Photo credit: halahmoon via Flickr). 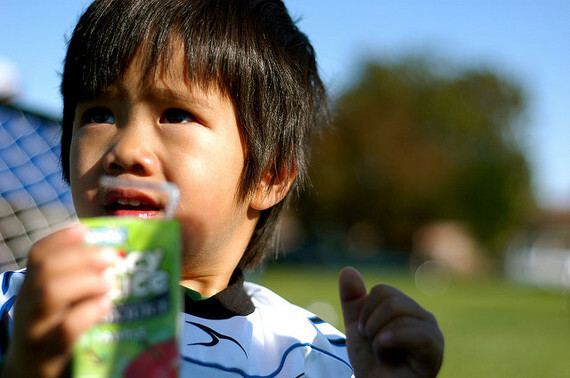 Children need six to eight cups of fluids a day. 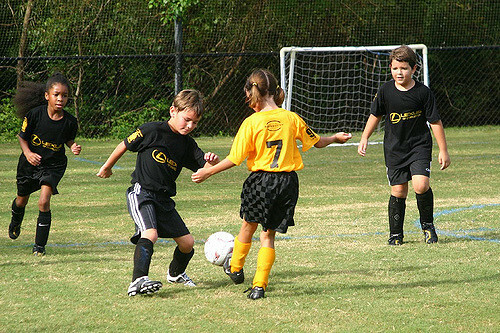 And when kids are active, they need much more; they can lose up to two cups of fluid every hour through their sweat. The American Academy of Pediatrics recommends kids drink fluid every 15-20 minutes during activity. How can you get kids to drink this much this often? (Photo credit: Tommy Fjordborge via Flickr). Always offer water to kids at meals and snacks and throughout the day. Bring water bottles with their favourite characters on them to their activities. 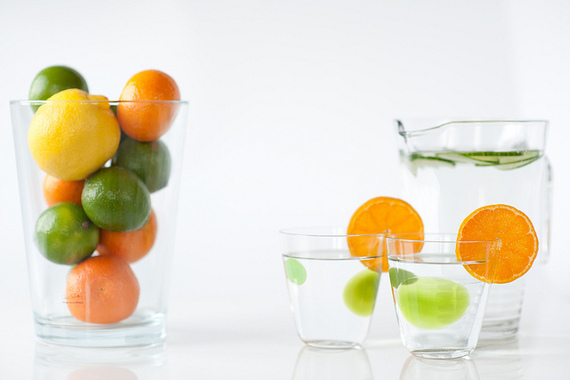 If your kids aren't keen on the taste of water, try flavouring it by infusing with fresh or frozen fruit. Try my Strawberry Kiwi Flavoured Water for a recipe that has no added sugar and is naturally rich in vitamin C.
Rich in calcium and vitamin D for growing bones, milk or fortified milk alternatives such as almond milk, hemp milk or rice milk are healthy choices for growing kids. Make sure your milk alternatives are unsweetened to limit your child's intake of added sugars. For children under two years, offer whole milk. Their growing brains need the extra fat and calories. Once children turn two, offer lower fat milk (1% or 2% MF) or milk alternatives. If you'd like to offer skim milk, wait until children are five and older. Photo credit: fosterx2 via Flickr). Anything that is liquid at room temperature counts towards your child's fluid intake, and nothing is more refreshing than a frozen treat on a hot day. The problem? Most popsicles, ice cream and frozen yogurts are packed with sugar and artificial flavours and colours. 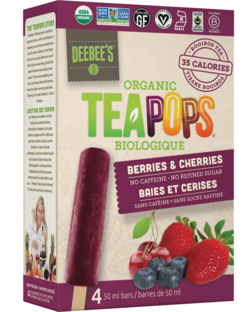 Look for a popsicle that's low in added sugars and uses only naturally ingredients, such as DeeBee's TeaPops. 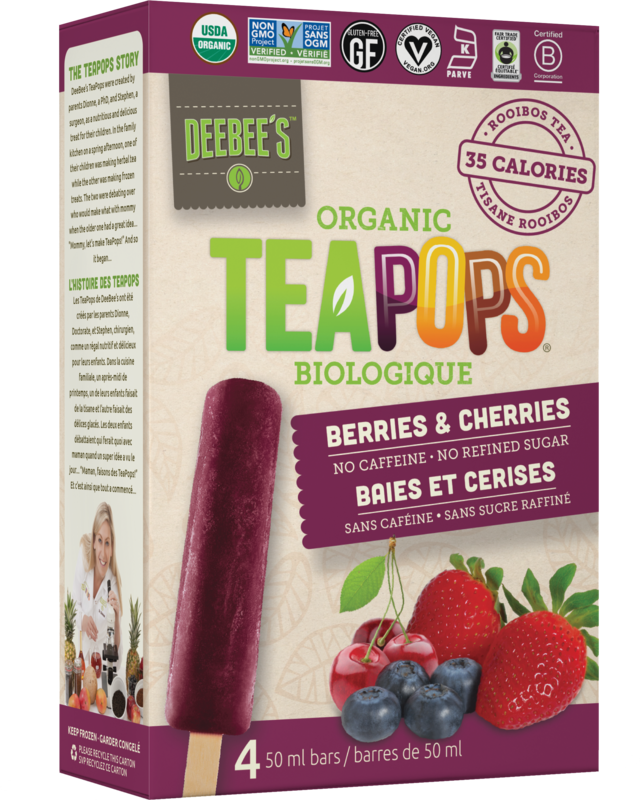 The fruit-based pops are only 30-120 calories each and are made from 100 per cent organic ingredients. They're rich in antioxidants from fruit and caffeine-free, herbal tea. (Photo credit: DeeBee's Organics. Used with permission). (Photo credit: Ida Myrvold via Flickr). You're looking at a snack and a hydration opportunity rolled into one when you make your kids a healthy smoothie. Store-bought smoothies are often loaded with added sugars that make them more of a dessert than a beverage. Make sure your child is getting the best ingredients possible by making smoothies at home and packing them in a fun bottle with a straw if you're on the go. 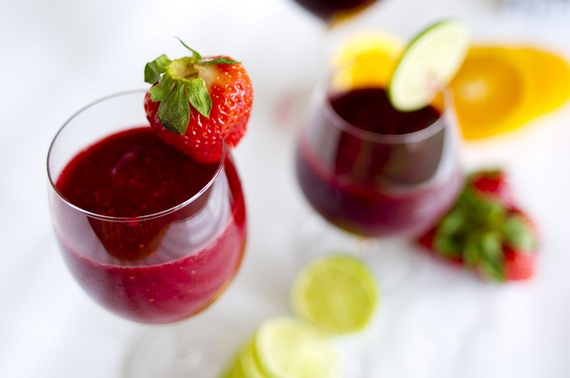 Always include a source of protein and some fruit in your smoothies to keep your child satisfied and energized. Try using milk or organic soy milk with yogurt, nuts or seeds blended with fruit. You might even be able to sneak in some leafy greens! Another frozen treat to help your kids cool down and hydrate: DIY froyo! 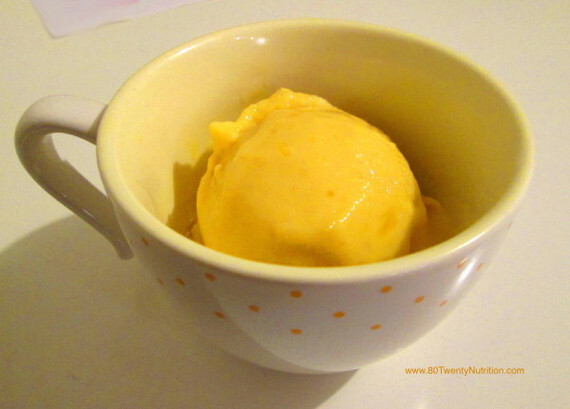 Made with only three ingredients, yogurt, frozen fruit and water, this Mango Frozen Yogurt recipe is a healthy dessert that can help your kids meet their fluid goals for the day. Do you have a favourite hydration strategy that works for your kids you'd like to share with other parents? Join the conversation at 80 Twenty Nutrition on Facebook. Disclosure: Christy collaborated with DeeBee's SpecialTea Foods in writing this article. All opinions are 100 per cent Christy's own.